Many classic computers use 2364 or 2332 mask ROMs. No direct replacements are being manufactured to day and as a result the retro computer community has developed modern replacements. This adapter is a take on such an adapter and is based on the 28C64 / 28C256 EEPROM in PLCC form factor. The PLCC form factor allows the EEPROM to be socketed and therefore EEPROM is removable by the end user and can be easily reprogrammed by the end user with just about any EPROM programmer, including the very popular TL866. The PLCC form factor also allows through hole parts, while the adapter remains limited in size in both surface as height. 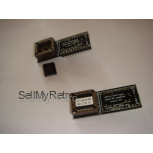 The item sold here is about a assembled version of the adapter sold with a Microchip AT28C64B EEPROM. Pins and the sockets have been installed. Round pins will be installed, so you can plug the adapter into both normal and precision IC sockets. The adapter comes with an instruction manual. It is shipped empty by default, but at your request it can be preprogrammed with a ROM image of your choice. You will have to supply the ROM image yourself. Do you rather prefer a parts kit that you can solder together yourself? Look here. Do you rather prefer bare PCBs? Look here.